rural blocks in low-lying areas near waterways. Living by a river or stream can be a nice lifestyle choice but it also comes with a certain amount of risk during periods of sustained heavy rain. Home owners who live near waterways need to be especially vigilant during extreme weather events and have a household plan to respond quickly should there be a flood risk. However, as an additional warning tool, the local civil defence office is keen to re-establish the Ōtaki River Watch. Scott Dray, who promotes community resilience on behalf of the Wellington Region Emergency Management Office, says river watch networks provide a valuable community service. “The purpose of a river watch is to create a structure within the community for the local Emergency Management Office (EOC) to connect to before and during flood events. 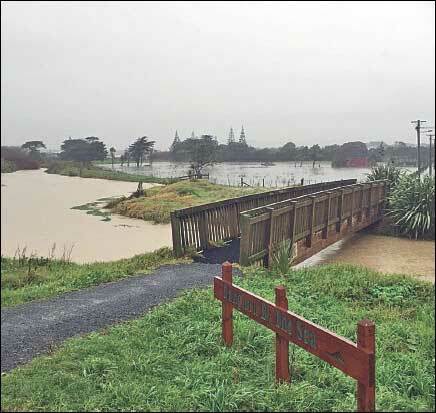 River watch coordinators help warn local residents living along the banks of the river and streams in the Ōtaki urban area, and act as the ‘eyes and ears’ for onthe- ground flood observations back to the EOC. “How the system works is that when electronic triggers are activated indicating the possibility of a flood, river watch coordinators are notified by the EOC. They then phone a list of residents along the river to warn them. The time commitment is very small but the contribution to the community is vital. If you are interested in becoming a river watch coordinator or would like to know more about the role please email: scott.dray@gw.govt.nz or call 04 296 4629.